"Inception" is the film that will finally give Christopher Nolan the Oscar nominations for Best Picture and Best Director he has for so long deserved. Or at least it should be. This is a supremely intelligent work of art delving into the dreams of reality and the reality of dreams like no other movie in recent memory. And it comes from Nolan, one of the most talented storytellers working in cinema today, in the form of the biggest movie event of the summer. As a combination of "The Matrix," Charlie Kaufman's "Synecdoche, New York" and James Bond, the movie has the narrative puzzlement of "Memento" with the grand, epic scale of "The Dark Knight." Nolan dreams larger than life, and best of all, he succeeds. Consider the feeling you get after jolting awake from an intense dream that feels all too real. That's how leaving "Inception" feels with your heart racing, head spinning and nerves jangled. Fitting, then, that the movie is about understanding dreams and the process of creating a reality within them. This concept opens up a labyrinth of possibilities, and Nolan navigates these possibilities with complete control through a screenplay that supposedly took him 10 years to complete. The film is impervious to spoilers because it's almost impossible to describe in words, and any details that might give anything away would not and elicit confusion instead. If there's any movie out there that needs to be seen to be believed, this is it. With an ending so powerful prompting one of the most diverse audience reactions I've experienced, you will need to take a moment to set yourself back in the real world once the credits roll. There is no possible way to fully comprehend it upon a first viewing, but you can immediately appreciate its grandeur warranting multiple viewings. Prepare to have your mind twisted, turned inside out and then completely blown because this 148 minutes is more than worth the effort. Cobb (Leonardo DiCaprio) describes how an idea is the most resilient parasite and that an idea planted in the mind is a seed that can grow to change the course of a life. He is a skilled professional hired by corporations to infiltrate the subconscious of others to steal their ideas, a practice known as extraction. Cobb, though, is hired by a wealthy corporate man, Saito (Ken Watanabe), to do just the opposite. The job requires Cobb to perform an experimental procedure called inception where he will plant an idea deep into the mind of a young billionaire, Robert Fischer Jr. (Cillian Murphy), an idea that will eradicate a corporation that rivals Saito's. All Cobb wants to do is to be able to go back home as a free man. After a terrible accident he was forced to remove himself from his family, but completing this job would allow him to return. It's a job he can't refuse and a job he vows will be his last. A meeting with his father-in-law, Miles (Michael Caine), leads Cobb to discover his new architect for the job, Ariadne (Ellen Page), who is a smart and promising student and a genius when it comes to building and replicating spaces. As a test of her ability, Cobb has her sketch a maze in under a minute, but what Ariadne will sketch for the job is much more elaborate and fully realized. She must create a space within Fischer's dreams that is a deceptive maze, and this is all described to her by Cobb as they sit at an outdoor café in Paris. His discussion with her about fabricating environments within a dream while navigating and manipulating them is Nolan's way of teaching the audience how to follow along. In one of the film's most impressive sequences, the interior of a dream is introduced as the environment around Cobb and Ariadne starts dismantling itself and shattering all around them in a gorgeous slow motion effect. The cityscape lifts into the sky and literally folds onto itself. 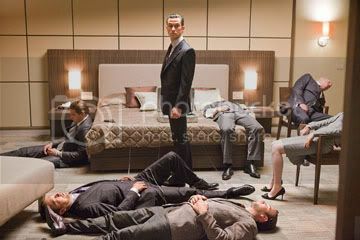 They assemble a team to begin the infiltration process which includes Cobb's close associate, Arthur (Joseph Gordon-Levitt), a disguise master named Eames (Tom Hardy) and Yusuf (Dileep Rao) whose concoction of a sedative will allow the participants to stay asleep during their extensive inception. You see, they eventually dive into four levels of dreaming which means the plot is at one point simultaneously dealing with five layers of reality. You heard that right. Five layers. Yet it never becomes muddled or too disorienting--of course it has to be disorienting at least a little bit--as it progresses with a forward momentum that reaches the breaking point of intensity. It is accented with a pounding and brassy musical score by Hans Zimmer echoing that of "The Dark Knight." Physics and time are altered as they descend deeper into the layers. Seconds in the first layer of a dream are minutes in the following layer which then descend to what could be hours, days or even weeks. This allows for visual flourishes that are downright awe-inspiring in many instances. When a van carrying our heroes tumbles down an incline, this places the second layer Arthur in the midst of a gunfire showdown in a rotating hotel hallway. When this same van gets launched off the edge of a bridge, gravity in this second layer ceases to be. The special effects have a mind-bending effect not only in looking great but also in making sense with the circumstances of the dreams. Scenes from the movie's trailers which seemed illogical make wondrous sense once in context such as sceneries tilting and shifting right before your eyes, a freight train barreling down a busy street and crumbling buildings in a dilapidated state of limbo, the result of death in a dream while under Yusuf's strong sedative. All of the performances in "Inception" are superb. Leo DiCaprio is impressive carrying a brooding weight with his role of Cobb who, unbeknown to his colleagues, has performed inception once before with devastating results. Marion Cotillard is fantastic as always playing Cobb's tender yet sorrowfully vicious wife, Mal, who perpetually invades whatever dream Cobb occupies because guilt from his past keeps her locked in his subconscious like a prisoner. Cotillard's presence has a saddening love that lingers in the scenes between Mal and Cobb. As Ellen Page's first adult role, she fits in seamlessly, and I can't help but hope this is the start of a new trend for her because it's refreshing to witness. Also notable is Joseph Gordon-Levitt whose shining moment arrives when he solely wrestles with a batch of floating sleeping bodies. The brilliance of "Inception" is the way it fits huge metaphysical ambition reflecting one's own sense of a dreamscape into an action Hollywood blockbuster structure without one hiccup. It makes the chase sequences and other conventions of the action genre feel like something wholly original all over again. With "The Dark Knight," Nolan reinvented the superhero movie. I think now he may have just reinvented, well, the standards of explosive commercial entertainment. He said his film is what Hollywood blockbusters should all strive to be. I couldn't agree more.